New professional Lucy Maguire reports on the recent ARA emotional support training. As the University of Glasgow’s Great War Project comes to an end, Project Assistant Katie McDonald reflects how such projects can engage with communities and distribute the information held in archives through different means. Aspiring archivist Sophie Gilmour shares her rather intensive approach to gaining valuable volunteer experience in archives. Read about some excellent examples of learning projects discussed at a recent Archives for Learning and Education event. Imperial War Museum Archive Assistant Megan Joyce shares how a love of social history led her to pursue a career in archives. 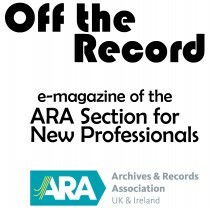 SfNP Chair, Sara Brimble, discusses the recent ‘Let’s Get Digital!’ event at The National Archives. Georgie Salzedo, Archivist at De La Rue, discusses last month’s joint BAC/ICA SBA Conference on the topic of trust in business archives.